Clem Hill was a contemporary of Victor Trumper and for a period was rated as the greatest batsman in the world, and is still considered to be one of the finest left handed batsman produced by Australia. He is still fondly remembered as one of South Australia’s favourite sons and recently had a grandstand named after him at the Adelaide Oval. These reminiscences were first published at the height of the Bodyline controversy in the Adelaide afternoon newspaper The News appearing in 20 parts. 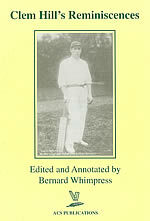 A number of the anecdotes and memoirs have been quoted in cricket books on numerous occasions, but there is a lot of material that I for one had not previously read. Hill surprisingly makes no mention of the eight Test Matches that he played against South Africa, and disappointingly fails to make mention of his famous brawl with a fellow Test selector during the 1911/12 Ashes Test series. Clem Hill seems to have had a keen sense of humour, relating many amusing tales of ship life and cricket match banter during the ‘Golden Age of Cricket’ (1890-1914). “F.S. Jackson was making a stand in England’s second innings when Trumble caught and bowled him as he had done so often before with a slow ball. It was the last over of the day. Disgusted that he had fallen into the trap again, Jackson shouted out, ‘Damn!’ and he was heard all over the ground”. Bernard Whimpress supplies a short but interesting biography of Clem Hill. His annotates are always informative but never intrusive. I really enjoyed these reminiscences, and was only disappointed that it was not more comprehensive (which is of course no fault of Bernard Whimpress).